Laney Pham (pictured on the left in the photo to the right) of Battle Ground High School and Isabella Daltoso of Vancouver School of Arts and Academics (VSAA) were the top two finishers of the Southwest Washington Regional Poetry Out Loud contest held at Educational Service District 112 on February 6. They will advance to the state-wide competition which will be held in Tacoma on Saturday, March 4, 2017. The Washington State champion winner will receive $200 and an all-expenses-paid trip to Washington D.C. to compete in the national contest. The state winner's school will receive a $500 stipend for the purchase of poetrybooks. The runner-up will receive $100, with $200 for his or her school library. The Poetry Out Loud National Finals are April 25-26, 2017, in Washington, D.C. Prizes include $20,000 for the Poetry Out Loud National Champion, and $10,000 and $5,000 for the second- and third-place finalists. The fourth- to ninth-place finalists each receive $1,000. The schools of the top nine finalists each receive $500 for the purchase of poetry books. There will be one honorable mention in each of the three semifinals competitions. 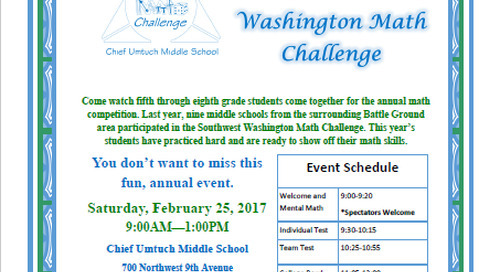 Those students will not advance to the finals, but will receive a $1,000 cash award and $500 school stipend. The regional competition, presented by ESD 112 in partnership with the Washington State Arts Commission, the National Endowment for the Arts, and the Poetry Foundation, is part of a national program that encourages high school students to learn about great poetry through memorization, performance, and competition. 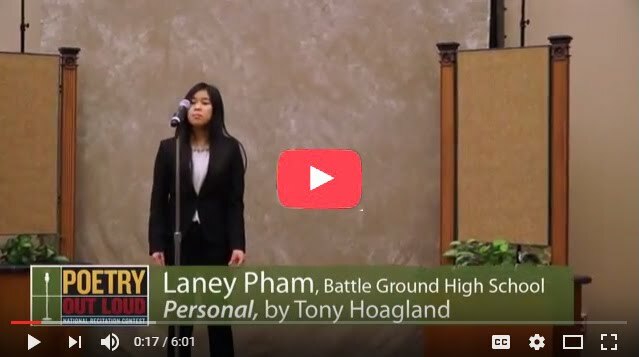 You can watch a video of the two poems that Laney recited at the competition, plus the announcement of her win on YouTube, or simply click the image below. Well done, Laney, and good luck at the state competition!